Best Help/Slip/Franklin's I've heard and the Uncle John's Band is what does this show for me. A great night for sure but I still personally enjoy 5/7/77 more mainly for the Wheel>Wharf Rat. Insanity! 3 straight nights in 3 different cities... Only the GD could endure such hardship and deliver some of their greatest moments... Where did they get the energy to sustain 3 consecutive nights (Peruvian Flake perhaps?) 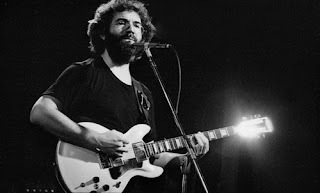 Irregarless, what a run the Spring 1977 Tour offered up... Not much is mentioned as to the root cause of what stirred such stellar and consistent playing by the band and especially Garcia during this run.. 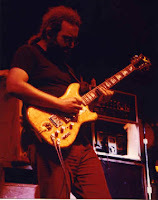 I have read speculation of the GD having gained confidence and momentum coming out of the hiatus and into the Fall 1976 theatre tour (just listen to 1976 NYE show to hear the seeds of SPring 1977 tour beginnng to germinate), the energizing forces of Garcia finishing up many big projects (Terrapin, Cats, and the GD Movie), and some have noted the calming effects of Persian take hold coincidently during this period... For certain, maybe all these factors come into play, however teh biggest factor I have ever heard is Garcia's chops were the tightest they ever were in his life because of the disciplined playing that Keith Olson required of him during during the cutting of Terrapin.. there are numerous reports of 100 of cuts/takes the ever perfectionist Olson requested of Garcia and he apparrently delivered with miminal resistance.. All this determination and focus carried over to Garcia's live playing as evident of the entire Spring 1977 Tour.. just spectacular from start to finish!!! 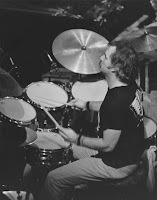 Great Review of 5-9-1977 and thanks for carrying the torch Noah! Must throw in as "best show ever" 5-18-77 Fox Theater, Atlanta, GA. The Stella Blue jam at the end brings tears. No doubt Spring '77 was magical! Well done, man. This one is especially meaningful to me. Particularly, the first set -- Help>Slipknot>Franklin's and Sunrise>MusicNeverStopped, as well as all the tunes in between -- have given me indescribable joy for nearly 25 years now. Thanks for sharing the love. Flipped on the GD channel at the casa right in the middle of Franklin's. I went from...hey Franklin's! to OH MY GOD in about 10 seconds...Amazing! Can't wait to give this one a proper listen. I dunno man, I think this is the one; the grail. One of the top shows of all time. A first set that smokes out of the gate like this is rare and then the 2nd is one for the legends. In combo, it's just over the top. A gusher. In what may be the most legendary month in the band's history, this is in the top 3 at least.